Does dog barking drive you nuts? Join the club! I suppose what we all want to know is why they do it and how we can stop them doing it. One of the things that sets dogs apart from other pets is their ability to bark as a means of communication. Though they bark for a variety of reasons. As a true pet lover, for you to fully understand your dog, you must understand the reason behind each bark. It is also a great way to build a healthy and lasting relationship with your dog. As a warning call when they want to alert people to the presence of danger or any suspicious strangers. Warning barks are what most dog owners want. 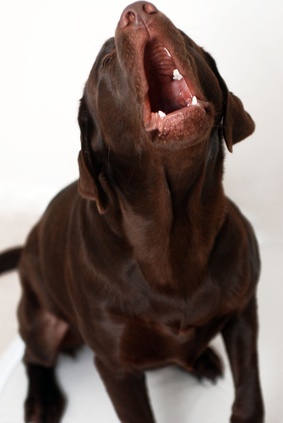 These kinds of barks usually start out as quiet and low but noticeable growls that escalate to a howling bark. When dogs play games or get too excited they also bark. Play or excitement barks are usually short and sharp, more like yaps. These are often the most annoying barks. Dogs sometimes give an alarming bark in response to events that are unusual to them which they feel needs your prompt attention. Best examples are when a car pulls up outside the house or the sound of the doorbell. Alarming barks are dogs' attempt to be informative, attentive, and alert. There are times when dogs feel lonely especially when left alone. They will bark in order to get your attention. Attention-seeking barking dogs are usually persistent yaps that turn into howls and are hard to ignore. Puppies are the ones that commonly use this type of bark. Sometimes you may notice that the dogs in your neighbourhood are all barking and may seem to be responding to one another. These dogs are displaying self-identification barks. This is their way to identify their selves to others and to let other dogs know of their presence. At times, dogs get bored and barking can sometimes be the only outlet of their energy and one way to create a more stimulating and exciting environment for themselves. Dogs that are experiencing separation anxiety will most likely to give anxious or lonely barks. These kinds of barks are usually high in pitch and are very annoying. When dogs are startled such as in cases wherein they hear abrupt sounds or see sudden movements, their initial response would be to bark. Startle barking is usually very short and disappears once the stimulus is gone. In most cases the problem can be controlled. As a dog owner, you need to be very patient in teaching your dog some behaviour modification techniques. The best approach is to first understand the reasons why your dog barks and modify the causes. For sure once the causes have been changed, the dog will stop barking. If the problem still continues, you may need to use other techniques such as using positive training methods, seeking professional advice, and using mechanical devices such as bark collar. Commonly used positive training methods are repeated exposure, distraction, and reshaping so the problem can often be solved with proper knowledge, right approach, and great determination. 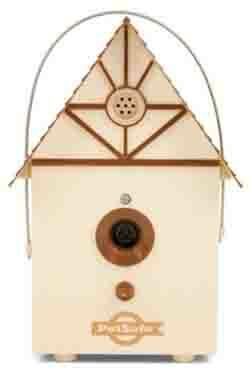 An outdoor dog bark deterrent uses an unpleasant ultrasonic sound to train a dog to stop barking. This can also be used to get a neighbors dog to stop as well. The device works up to 50 feet, and includes a timer so that it can be turned off and on at specific times. It works by teaching the dog that the unpleasant ultrasonic sound will go off every time the dog barks. People cannot hear the sound. The devices run on a 9 volt batter and are worth a try. There are several dog bark collar options available. They work by creating an unpleasant experience for the dog every time he or she barks. These collar are also called air spray collar. 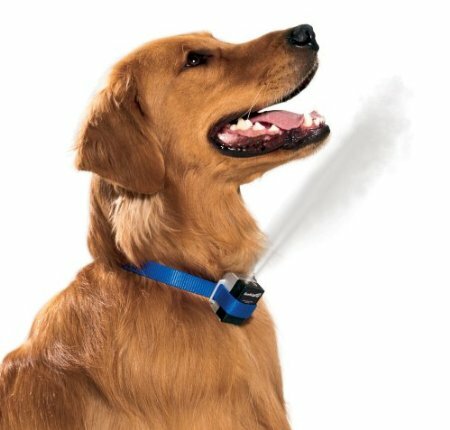 Air or Citronella Collar: The dog citronella collar works by emitting a harmless small spray of citronella every time the dog barks. Kits include a nylon collar, attachable spray device, spray and battery. Dog Shock Collar: A dog shock collar uses harmless static electricity to create an unpleasant reinforcement. Shock collars can be set to different levels of intensity. 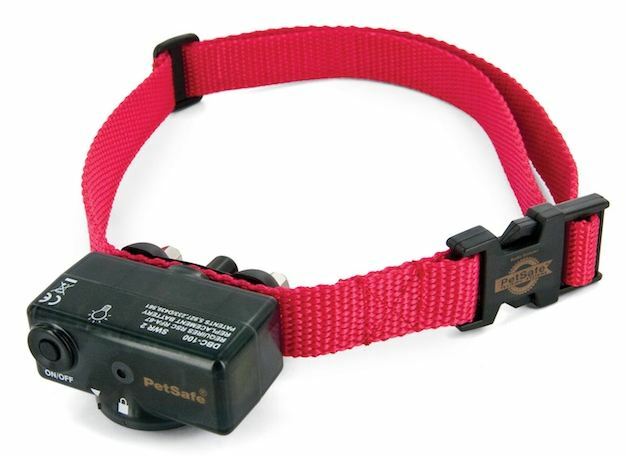 Collars such as the one offered by PetSafe offer manual and automatic control. A dog shock collar trains a dog to control her barking habits. The collar senses vocal chord vibration and uses a light flash, vibration and sound and static correction. The homeopathic remedy Problem Pet Solution is an all natural approach to help correct a dog bark problem. It is designed to naturally curb destructive behaviors. It is also a perfect way to improve a dogs receptivity to behavior modification efforts. Natural ingredients such as Scutellaria are known to calm nerves and aids the nervous system. Others such as Belladonna is a natural remedy used to support emotional and physical health.